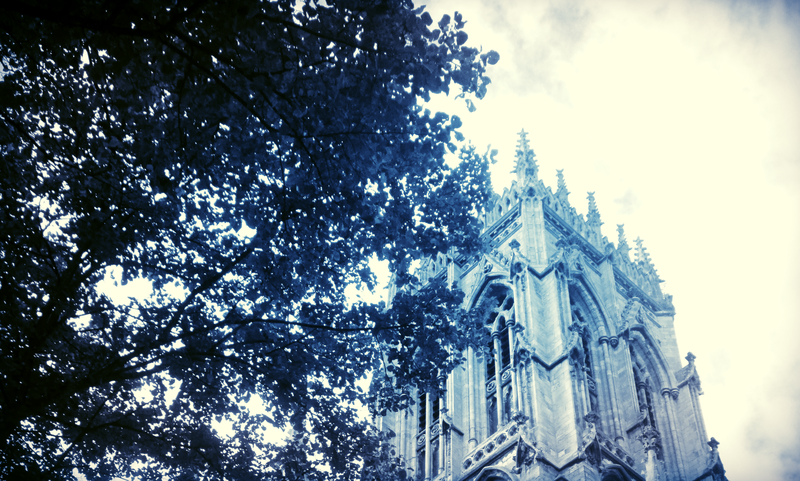 Wandering through Doncaster today, we noticed that the Minster was open to the public. As we stepped inside, a kindly woman handed us some xeroxed pamphlets and launched into a practiced spiel on the history of the church. All was quite interesting; we nodded politely, punctuating her words with Oh really?s whenever felt appropriate. The church seemed to us, avowed atheists, and to her, with such a prepared presentation, but a museum, a piece of history, an “excellent example of Victorian gothic” set between a motorway and a Tesco’s. But as we were leaving her to begin taking in the sun through the stained glass and memorial plaques affixed to stone, a young man snuck in behind us. He was in his early twenties, in a black t-shirt and ballcap. He had spots and seemed tired. He looked a stereotypical “youth” one might cross the street to avoid were it after dark and no one else were around. At the sight of him, the woman lost interest in us. He looked abashedly to her. He asked quietly: “Am I allowed in to pray?” Her rigid countenance immediately softened. “Of course,” she murmured, “Of course.” She ushered him through like a mother bringing all her children to the dinner table. Later, as Husband and I wandered through the church, we saw him, sitting quietly in one of the back pews, head down in his lap.